Hello, friends... remember me? It's been way too long since my last check-in, but that's the pattern I've settled into this winter. We've had a lot of visitors since my last update and I'm loving every minute - plenty of day trips, biking, new restaurants, and, of course, long walks on the beach. Winter storm Stella wreaked havoc with travel plans... my sister extended her time in Florida, while my daughter ended up taking the train from New Orleans to NYC after her flight was cancelled. Hopefully, that was the end of winter weather. Yesterday I attended the Southwest Florida Reading Festival. The highlight was hearing author Nathan Hill... what an engaging, funny speaker! I had him sign my daughter's book afterward. She loved The Nix and left it here for me to read. I've already added next year's event to my calendar. I kept turning the pages, but was only mildly entertained by this thriller. Maybe I should have listened instead? Most readers seem to love it... I'm definitely the exception. What a treat to read Trollope with Audrey again! We read The Barsetshire Chronicles with a few friends back in 2015, but I didn't return to Trollope at all last year. Now we're tackling the Palliser novels. Can You Forgive Her?, the first in the series, is basically a love story, but the backdrop is politics, rather than the churches of Barsetshire. As usual, I approached the novel as a read/listen combination. Listening to Simon Vance on my morning walk and reading in the evening, the 800 plus pages flew. We'll watch the 1974 BBC adaptation of The Pallisers next... episodes 1-6 cover Can You Forgive Her? If you'd like to watch, too, we're using the hashtag #PalliserParty on twitter. On New Year's Eve 1984, 85-year-old Lillian Boxfish takes a walk - a ten mile walk around Manhattan - and contemplates her life. This is such a good book! I'm enjoying it even more since learning that it's based on a real person. I'll finish today or tomorrow. Georgie, aka Lady Victoria Georgiana Charlotte Eugenie, is 34th in line for the throne of England, penniless, and such a fun character! The novel is set in 1930s London and is the first in a cozy series. I'm listening to it and Katherine Kellgren's narration is perfect! She reads the next few books, too. We'll see if I decide to commit to the series. What's new with you? Do you have any good books to recommend? Audrey - I want to read The Nix next (especially after meeting the author! 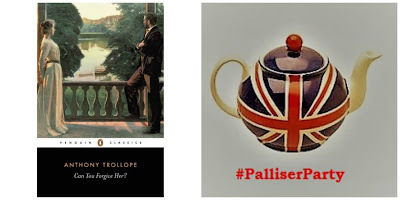 ), but could Trollope again after that. How soon did you want to start? Oh, no hurry...after Easter or even later? I have other books too... I'm just looking forwardto it! Audrey - So am I! After Easter sounds good... or even after we get home in early May. Sounds like you're having a lovely time in Florida, despite some weather glitches. I think everyone is happy that spring is finally here! Lillian Boxfish Takes a Walk is in my TBR pile and I hope to get to it soon. I hadn't realized it was based on a real person. That piques my interest even more. Glad to see your update. Enjoy the spring in Florida! Susie - Lillian Boxfish is wonderful. That type of novel almost always seems to work for me... an older person looking back over their life. Love how this one is framed around her long walk. The endpapers even have a map of Manhattan detailing her route! 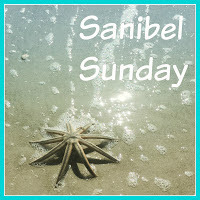 How nice to know you're fully enjoying your Sanibel time! I fully agree that "Her Royal Spyness" aka Georgiana is a fun heroine. I read this one and I read The Twelve Clues of Christmas, which featured her. I thought that one was very well done and I think you would get a kick out of it. A really good holiday read. Judith - I don't think I could read this series back-to back like I did with Winter Storm, Winter Stroll, etc., but I definitely see myself returning to Georgie for fun breaks! So glad you are back! Been awhile. That's very cool that you got to hear the author of The Nix speak. I'm on the waiting list at the library to get it. I've heard it's terrific. Looks long though -- if I get it this summer, it will take me awhile! Enjoy your days. Susan - The Nix is a very long book (over 600 pages), but my daughter is very sure I'll love it. Didn't realize there was a gaming component to it until his talk and that scares me a little. Will start it after I finish Lillian. And hopefully it won't be another month until I post again! I bet that was a long train ride for your daughter! Author events are so much fun - I love Hill's message in your daughter's book! Lilian Boxfish jumps out at me. I love New York and walking stories. Must read. I'm glad you are enjoying your winter in Florida. I have seen some of your photos on Instagram. We're just going into winter here. Autumn is generally nice. I like the cooler weather but not the shorter days. I should time my next visit to see friends in Ft Myers around their reading festival. Didn't know they had such a thing. Sounds fun. Will look at their link. Keep having fun. Love it that you're busy with friends and family. NICE! I really liked the audio of Behind Closed Doors, but I'm not sure I would have liked it as much in print. That's awesome you got to hear Nathan Hill! And I have Boxfish on hold at the library, so hope to read it soon. I've been looking forward to it. Sarah - Nathan Hill seems like such an interesting guy... he'd been a college English professor for about ten years and had some very funny stories to tell. Can't wait to start his book! It sounds like you had a good time at the book festival. It is so neat to attend and see and listen to one's favorite authors. It has been too long since I haver attended one. Hopefully I will get to at least one this Spring. Brian - The book festival was excellent! Wish I'd allowed more time to hear other authors, too... next year I will definitely plan an entire day. It's good to see you back, it sounds like you've been enjoying the sunshine and beach life. We're heading to Florida at the end of the week and can not wait. And I felt the same about Behind Closed Doors, which I read in print. I'm always a bit in awe, meeting authors. I've get a bit tongue tied once or twice, trying to tell them how much their books mean to me. Rhys Bowen has done signings here in Houston - she's as much fun as her books. She just released a standalone book, set I think in World War II. I haven't seen it yet. I'm so glad to hear that you're having a great time! I love that you were able to go hear Nathan Hill; I heard a radio interview with him that was just delightful. I love author events! Tara - I need to make author events more of a priority... they are always such fun!! I just picked up the Boxfish book based on the description alone. It reminds me of Harold Fry which I adored. Of course I have no idea when I will be able to read it. I have several book ahead of it. Ti - I know how that goes! The book is wonderful though. I've missed you but happy you're enjoying yourself. I loved Lillian Boxfish Takes a Walk. The writing is so beautiful, and the author puts you right there with Lillian. I'm one of the majority on Behind Closed Doors. I wished it had worked better for you. Enjoy your time in the sunshine state! Kathy - I'm sure I'll be passing Lillian Boxfish on to my mother and sisters. Behind Closed Doors is one I was wavering on, should I or not? I still don't know. :) Glad you are having a good time- sounds like a nice bookish festival too! Greg - Behind Closed Doors just didn't do it for me, but you might have the more typical response to it. 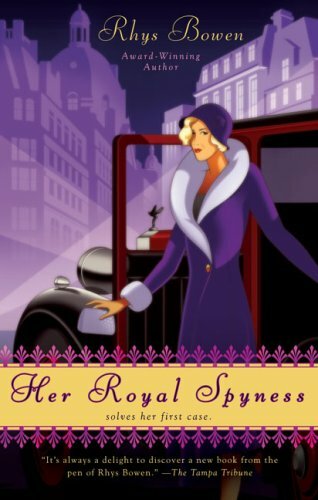 The Royal Spyness series is cute and I really liked her book In Farleigh Field about WWII. How fun to meet Nathan Hill! I haven't read The Nix but I've heard good things about it. Lillian Boxfish sounds really good. Adding it to my TBR! Have a great week! Katherine - I'll probably finish Her Royal Spyness today or tomorrow. It is a light change of pace book for me, but I'll wait several months before continuing the series. You have plenty of great reasons to have stayed away from the blog! I'm glad to hear you are having a great time. You'll have to share some pictures from your beach walks. Sound lovely! Your winter in the sun sounds so lovely, despite Stella and the havoc she caused. I am so looking forward to reading Lillian Boxfish myself, and I really need to get started on The Last Chronicle by Trollope. I've heard Can You Forgive Her is excellent--and such a different sort of title for a Victorian novel! Enjoy your time in Florida! JaneGS - The Last Chronicle was so good!! You're in for a treat . Can You Forgive Her was very good, but didn't hold quite the same magic for me as the Barsetshire novels. "Boxfish" is on my library's wait list. I'll have a new book to report soon on IG. It's a non-fic and has quite a lot of good reading to digest. Glad you are enjoying you winter outings in the Sanibel area. Sounds like a lot of fun. Her Royal Spyness has been on my list, and I'm so glad to hear it's great on audio! Unruly Reader - The audio was amazing... that's definitely the way to go with Her Royal Spyness! 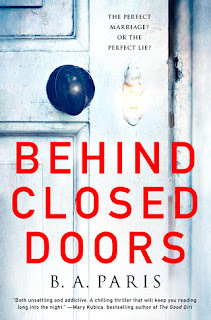 I kinda enjoyed the audio of Behind Closed Doors - sorry it didn't work for you. This week I tried both the audio and print copy of Lilian Boxfish-- definitely not a book for me. Hope u have a good week. Diane - I think I would have had much better luck with Behind Closed Doors on audio.... wish I'd gone that route. 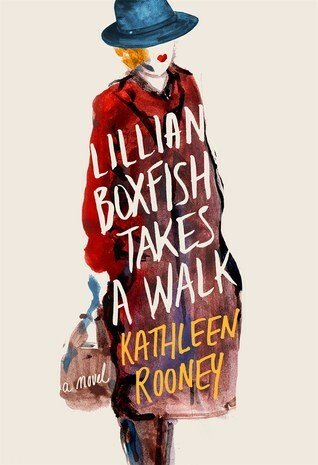 Lillian Boxfish is definitely not for everyone, but I thought it was delightful! it will be there when you are ready to be back! I've been away for a month too and am only just beginning to visit blogs.